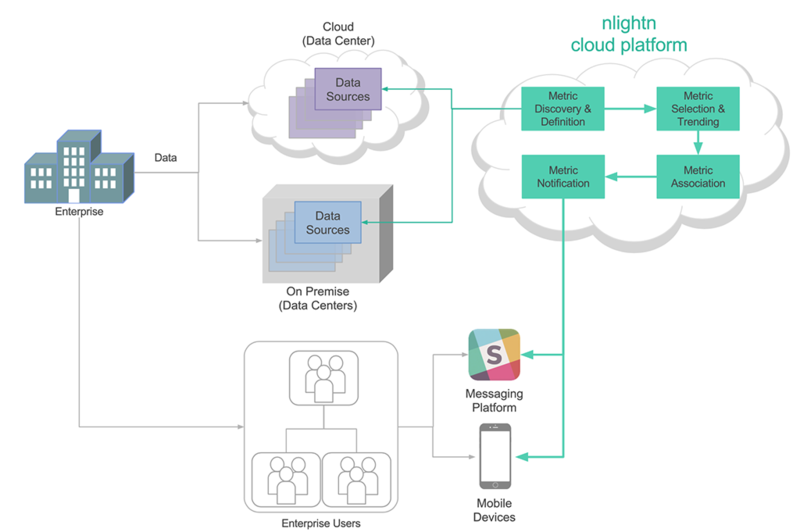 nlightn, an Analytical Intelligence platform is a cloud based service offering.The nlightn platform can be configured to discover your company metrics from the data you capture in your operational systems. Once metrics are defined, the platform enables you to measure your organization’s performance, efficiency and customer satisfaction. Metrics are defined based upon the industry your business operates in. Metrics also vary from at the corporate level to the various functions and roles in your enterprise. To read more about metrics and how they are defined … click here. nlightn works along side your data center or cloud with your existing data, BI and analytics infrastructure. It also works complimentarily with other BI, Analytics and reporting tools that are already deployed. nlightn augments your current reporting & dashboarding applications without having the need to replace them. The nlightn platform can be configured to discover your metrics and configure them based on the measures that matters most to your organization in tracking performance, efficiency and satisfaction. Metrics are defined based on business functions and roles in your enterprise. Once configured, nlightn feeds off of your enterprise's data, tracks trends and their contributing factors. And based on the pre-defined metrics, notifies subscribed users of actions to be taken. You can subscribe to a specific set of metrics that you or your team would like to track by department or job function. The platform which will then deliver those preferred metrics to you on your mobile device and in the future any messaging platforms such as Slack. As nlightn highlights new trends and their contributing factors, you and your teams can focus your effort on what matters from a department or company goal, performance standpoints. We believe this would allow your organization to spot upticks and sustain growth, improve performance by following up in the right areas. Alternatively also identify any weaknesses and downtrends early enough to course correct as neccessary. Analysts and business metric owners can thereby be more productive and scale better to address business needs in a timely manner. Depending on the number of data sources that your enterprise has and the readiness of your data, a typical implemementation can take 1-2 weeks. Welcome to Analytical Intelligence, a new era of business insight computing. Please SIGN UP for a demo today to to see how your company can empower your leaders and decision makers in becoming a true data driving decision making entity.